We were pleasantly surprised with the big fun kids box. Everything pictured was in the box. We bought it as an Easter basket for our granddaughter. It was something different than what everybody else was giving. "Kids of all ages will be absolutely delighted to find this Big Fun box on their doorstep. Inside we've selected a great mix of tasty snacks, fun games and activities for them to enjoy now and again later. 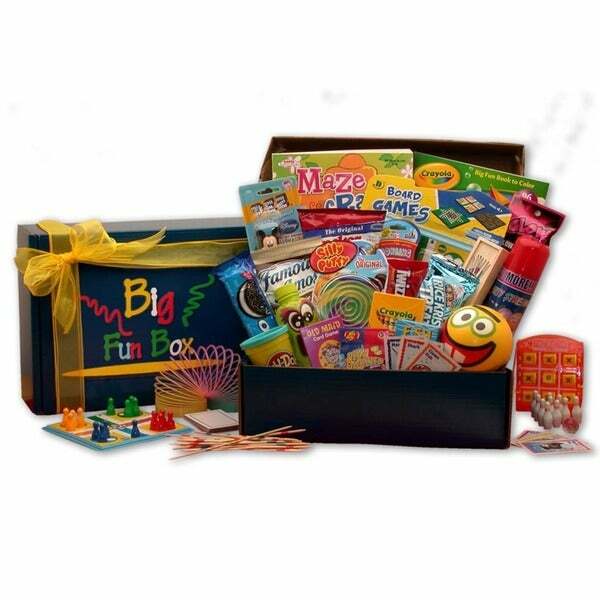 Hours of fun are included in this big box full of fun that would be great as a Birthday gift or a get well soon gift for kids of almost any age. 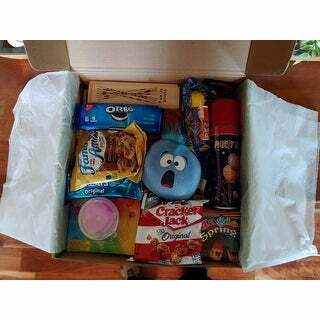 Unique gift box complete with fun games and snacks. A perfect gift for children and even tweens for Birthdays, get well, holidays or just because. Full of travel games and a small table top board game the activities in this box will keep them busy with hours of fun. Lots of classic favorite snacks to enjoy while they play the games. The box was just ok. Really disappointed in how late the individual received the package. Ok, not a big hit for kiddo's.. I sent this as a gift for one of my sis kids in another state. The had pretty good fun with it. Hope it was set up as nice as the picture. Very cool idea. Loved it! Exactly what I wanted to get for mt nephew. My Granddaughter has a birthday coming up. Since I am not sure if I will see her then, I thought this looked like a lot of fun. It has many fun-filled activities along with many of my grandson's favorite foods. We are traveling over Easter and this seemed like a great mix of entertainment and treats for the kids so we are using these as Easter baskets!